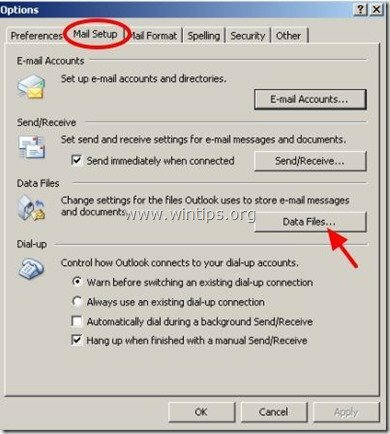 If you are using Microsoft Outlook as your personal organizer (Tasks reminder, Calendar, Mail application), then you have to backup its contents very often, to avoid loosing Outlook data when your computer crashes or if you want to transfer its contents to a new computer. First of all you must know that all Outlook personal folders are saved in one file on your computer (e.g. Outlook.pst) and if you backup (copy) this pst file to another location on your computer (e.g. your external USB disk), then you 'll have a reliable backup of your Outlook data. – Auto Complete cache (suggested contacts), etc. 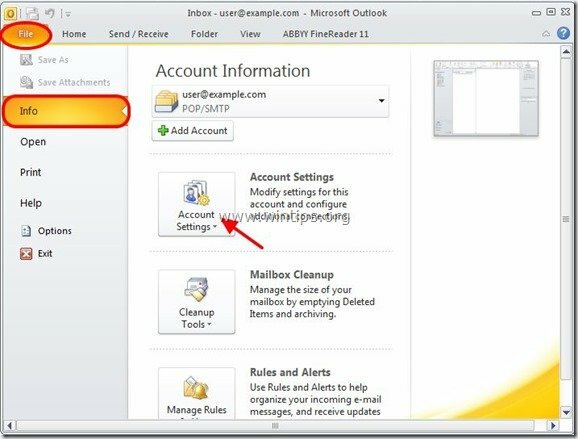 Related article: How to Backup & Restore Outlook Account Settings. To backup your Outlook's data, follow the steps below. 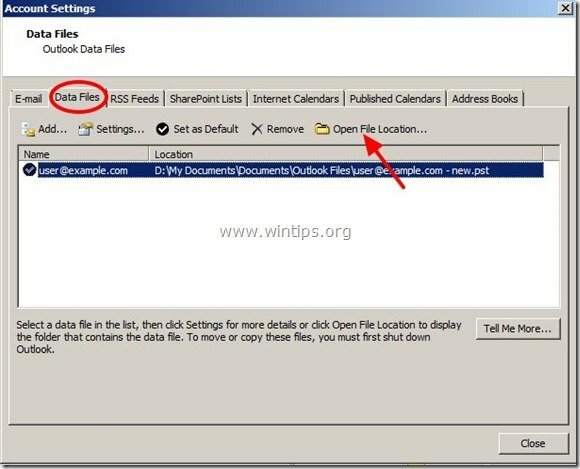 Step 1: Locate Outlook Personal folders data file (.pst) on your computer. Notice: Before proceeding to find the the Outlook data file (.pst), proceed and Enable the Hidden files view. (From Control Panel > open Folder Options and at the View tab, check the “Show Hidden files, folders and drives” option). 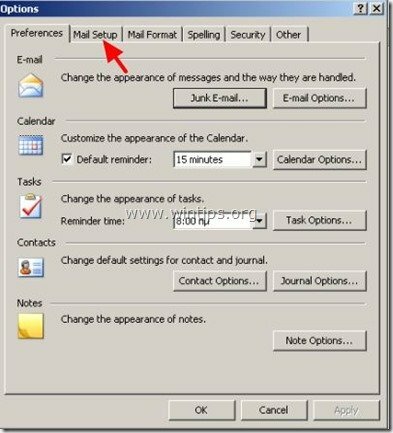 * In Outlook 2007 go to: Tools > Options, click the Mail Setup tab, and then click E-mail Accounts. 2. In Account Settings window, choose Data Files tab and click to Open File Location. 3. Continue to Step 2. 2. In Options window choose Mail Setup tab. 4. In Data Files window, choose Open Folder. 5. Continue to Step 2. Step 2: Backup your Outlook PST Data files. – As you can see, on your screen there is a file named “Outlook.pst” *. 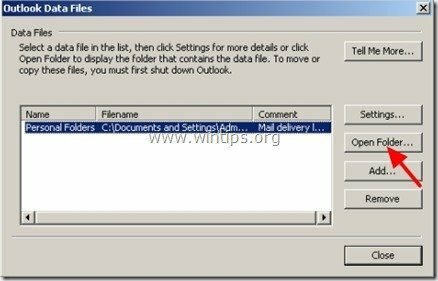 This file contains all Outlook folders such as Calendar, Inbox, Tasks, Sent Items, Outbox, Deleted Items, and user-created folders. 1. Close all open Outlook windows. 2. Copy the Outlook.pst file in another location on your computer (e.g. your external USB hard disk drive) and that’s it. – By copying Outlook PST file(s) to another storage media, you 'll always have a reliable backup copy of your Outlook Data until today. To keep this backup updated, you must repeat the above procedure often. – If you want to restore the Outlook PST file on another computer (or new after a new Windows installation), then read the instructions in this tutorial: How to Restore Outlook PST Data files. 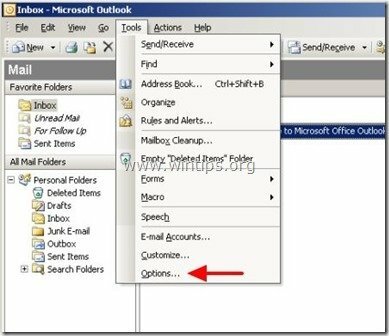 – If you want to open the Outlook PST file on another computer, then read the instructions in this tutorial: How to Open Outlook PST Data files. « Convert DVD to Avi	» How to Backup Outlook 2003, 2007 or 2010 PST Automatically. Hi Lakonst, thank you for reply and the link. I'll take a look at it. Is there any way to import .OPS file created in Office 2003 into Office 2007?